"Award Winning" Parrot Popcorn Nutri-Berries. Look what popped on the bird snacking scene! 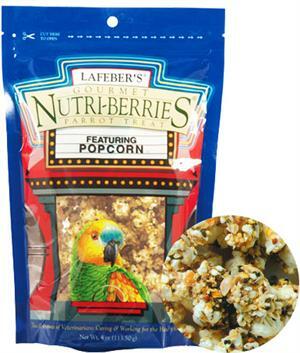 Parrots everywhere are giving high marks to Lafeber's Parrot Popcorn Nutri-Berries. This healthy snack features peanuts and their favorite seeds, all packed with a caramel flavored taste and aroma. Bird nutritionists love Parrot Popcorn because it's a healthy, nutritious snack. Popcorn Nutri-Berries are made from natural, wholesome ingredients and enriched with vitamins and minerals.